So what does that have to do with iSlaytheDragon? We are a blog that strives to be timely, and as such, our reviews are often a “sip test.” We play games several times before reviewing them, but numerous pressures (timeliness, deadlines, variety) generally prevent us from “whole beverage” kinds of reviews, reviews of games that have stood the test of time for us. And that’s okay. As I’ve said over and over again, we’re reviewers, not critics. We strive to help our readers discover games and determine whether those games are worthy of their gaming dollars. The “whole beverage” test we leave up to our readers. But the thought of going deep rather than simply broad with reviews is appealing. Hence this new series, which I’m calling Shelf Wear. Shelf Wear will focus on games that we’ve played a lot, quantified to 50+ plays. Chances are these will be games we’ve already reviewed or at least talked about, but our opinions may have changed with (or are at least better informed by) experience. The first Shelf Wear retrospective review is of 7 Wonders. I got my copy in June of the following year, right after it won the inaugural Kennerspiel des Jahres. My first play of the game was lackluster, as were my subsequent plays. The game was interesting enough, and it did fill a specific niche pretty well, but I seemed to keep playing it as the default choice. Because it fit the gaming situations I found myself in, it got played a lot. There were usually too many players for Dominion, and it was more strategic than Incan Gold, and less intense than The Resistance. It got played simply because it was there. In romantic terms, it was the dependable girl friend in whom I faithfully confided after failed attempts to throw myself at other, prettier girls. 7 Wonders, as you can see, is not a game I immediately fell in love with. But as Hollywood romantic comedies teach us, it is often the affection earned from continued exposure that leads to love in the end. And, indeed, after continued exposure, today I would say that I do love 7 Wonders, placing it among my top ten favorite games. This leads to the game’s balance. 7 Wonders is remarkable for how it allows and rewards divergent strategies. I’ve seen players win with a full military; I’ve seen players win with none. Lots of science, no science. Commerce, civic structures, money, variety–I’ve seen all strategies win. The trick for players is capitalizing on the opportunities presented to them, choosing the optimal card from a hand that may not be seen again. In addition to the card balance (which is aided by the distribution noted on the cards), players begin with asymmetrical player powers, but these, too, are balanced: I’ve seen every wonder win. There’s the minor asymmetry on the A-side of the wonder and the more substantial asymmetry on the B-side. Each wonder pushes players in a strategic direction without confining them there. Rhodes needn’t be a bully, Babylon needn’t make all the scientific discoveries in order to win. The game is tactical and fluid, allowing players to switch signals and still remain in the game. Some criticize the game as being multiplayer solitaire, but to me that seems like a sip test criticism of the game. To be good at any drafting game necessarily involves paying attention to what other players are doing. If you focus solely on the cards that are good for yourself, you will pass the sixth science symbol the player to your left needs, or the next card in a building chain, and so on. I’ve found it’s true that the first game does feel like solitaire: 7 Wonders feels different from many other kinds of games, especially if it’s your first encounter with drafting. It takes time to get your bearings in the ancient world. The next game you might focus only on the neighbor you’re passing to. The game after that you might focus on both of your neighbors. But slowly, as understanding dawns and less brainpower is devoted to the at-first taxing decision of which card is most valuable for yourself and which icons mean which, you will find yourself surveying all opposing kingdoms, noting the strategy that each player seems to be employing, and evaluating each hand in light of this. This sort of understanding, familiarity, and comfort with the game is hard won–it comes after many, many plays–but this is when the game becomes very rewarding, especially when the other players at the table are on the same skill level. It makes every decision tense and exciting as you realize that a choice for that juicy military card means a choice against every other card, in addition to handing your opponents what might seem juicy to them. The interaction in 7 Wonders is not direct conflict, it’s true, but interaction is present in every pack of cards, in every decision of the game. For this reason, 7 Wonders gets better with age. As players get to know which cards are available as well as which cards best benefit which strategies, they are better able to make wise, informed strategic decisions. But 7 Wonders isn’t a game of perfect knowledge, despite players gaining familiarity with the cards, so it doesn’t become a stale exercise. 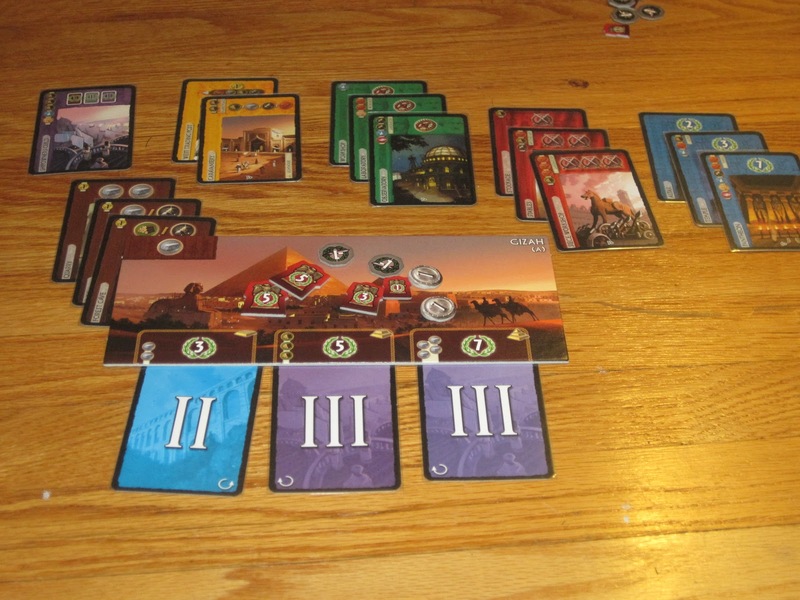 As 7 Wonders is a card game, the order of cards will be different each game. Similarly, as players’ starting wonders change, starting resources change as well, granting or stemming access to certain cards. And in each game, there are random guild cards added to the game, which primarily reward players for what their neighbors have done during the game. Everything can score players points, but the guild cards add an element of uncertainty when considering opponents’ strategies. There have been games where I was able to gain the advantage over a science-crazy neighbor with a well-placed guild. Of course, I’ve been on the losing end of that, too, when my neighbor rides the coattails of my civic structures to the top. The point is, there are enough new decisions every game to keep it interesting while the old kinds of decisions get better and better as players gain experience. 7 Wonders is a strange game in that I like the expansions quite a bit, but I don’t use them often. There are almost always new players at the table who need to adjust to the base game first, so the expansions usually stay in the box. And if this were any other game, I might be muttering under my breath about the waste. But the base game has so many options and is so good by itself that I don’t begrudge the experience of playing the game in its simplest and purest form. When I first reviewed the game, I reviewed it in the context of the hype it had been receiving so soon after its release. Now, over two years later, the dust has settled, and 7 Wonders still stands as a modern classic. The hype is nearly gone, and yet this game consistently earns a spot in my gaming bag at almost every gaming event I attend. And now, despite my early indifference toward it, after over fifty plays, it is an indispensable part of my collection. I still look forward to the next time it hits the table. I really like the idea of this series, and this was a great first entry. I’ve always been impressed that 7 Wonders flows so well even though you have 7 people making independent decisions. That doesn’t always happen with simultaneous action games, and they pull it off perfectly. And I agree: the 7 Wonders flow is one of its biggest accomplishments. I feel like there is a problem with this series. It’s a victory lap. If you’ve played the game 50+ times you clearly love it. Now talking about why you love games is valuable but this series is more or less a hall of fame. Maybe a parallel series of games you liked when sipped but have not stayed in steady rotation? It would be an interesting counterpoint. You’re absolutely right in that most games (not all) that I’ve played 50+ times are games that I’ve loved, and that is a weakness of the series. The value for this series, such as it is, is in seeing how love for a game has changed or grown versus a complete change of opinion, the way a relationship matures after years of marriage. In any case, your counterpoint series is a good idea, and I’ll have to think of a way to implement it. Thanks for the comment! It’s a possible weakness, but not a given. I’ve played plenty of games that, after 50+ runthroughs, lose their luster because they reveal a lack of depth or have an unbalanced strategy. For example, I loved Stone Age at first, but after playing it for a while (and then being introduced to Agricola) I got pretty tired of it. And I’m usually in no hurry to break out Settlers of Catan again, after playing it constantly all through college.